Champion Tool Storage finds its servo-electric press brakes (Prima Power eP-1030 models) fast, accurate and versatile, and able to reduce power consumption and maintenance compared to its hydraulic brakes. For nearly a year it ran its first servo-electric press brake two shifts per day, 10 hr./shift, five days per week. To ease its growing pains, the firm added a second eP-1030 in December 2013. Garin Buckles began his career in fabrication as an apprentice at the age of 15. In 2006 he realized his dream of starting his own product line when he launched Champion Tool Storage out of a garage in Oregon. Buckles retained his full-time job to cover expenses and worked afterhours and weekends to launch his fledgling company. In 2007 Champion obtained its first large order from a division of Snap-On’s military group. Buckles subcontracted the manufacturing while he managed all of the engineering and financing. In 2008 Buckles left his full-time job, moved Champion into a 2000-sq.-ft. facility, and began to hire employees and acquire fabricating equipment. “I would do all the design and develop the flat patterns, and then have local fabricators perform the laser cutting and forming,” Buckles recalls. “I then would have the parts shipped back to Champion and I would perform the welding, finishing and packaging operations. Buckles purchased basic machines, including an 8-ft. CNC press brake and additional welding equipment, all the while striving to meet deadlines and grow his company. “I had a short amount of time between testing, approval and production,” he says with a grin. By 2011, Buckles determined that his company was ready to invest in modern bending technology. Champion fabricates 150,000 lb. of material each month, and nearly all of it routes through the Prima Power press brakes. The firm manfuactures fixed and mobile storage cabinets, workbenches, tool boxes and carts, wall systems, and more, including 14 different drawer heights for its modular series of products. Servo-electric press brakes are fast, accurate and nonhydraulic bending solutions. They’re versatile yet deliver reduced power consumption and require less maintenance than do hydraulic brakes. Buckles is impressed with the press brakes’ ease of programming. The eP-series utilizes a Windows-based control that includes two separate processors, one for real-time operations and one for bending-application tasks. At the press-brake control, operators download bending programs and pull up matching part numbers, which gives them the setup sheets—no need to figure out tool lengths, what tools to use or the bend sequence. That process, combined with quick-change tooling and a hydraulic top clamp for the press brakes, has enabled Champion to reduce setup times from 20-30 min. to just 5 min. Included AutoPOL offline-programming software allows programmers to perform bending simulations, shortening setup times and ensuring that bending tasks can be performed. Programmers can develop 3D models with AutoPOL, or models can be imported in 2D and 3D from a separate CAD program. AutoPOL’s bend-allowance algorithm accounts for bending tools to obtain correct radii and also calculate accurate unfolding dimensions. Buckles also invested in quick-change tooling and a hydraulic top clamp for the press brakes. “Altogether, the software and tooling have allowed us to reduce our setup times from 20 to 30 min. to just 5 min.,” he says. Champion processes 150,000 lb. 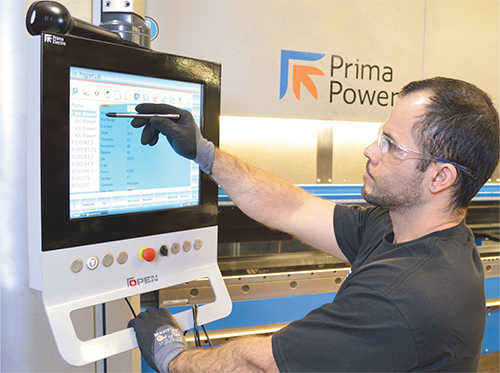 of material each month, and nearly all of it routes through the Prima Power press brakes. Buckles also notes that the speed and flexibility of the new press brakes play a vital role in supporting the firm’s growth. Quality also has improved, due to eased setup and the repeatability provided by the new brake. “We no longer have to make setup parts,” says Buckles. “We produce only the blanks that we need (from the firm’s punching and laser equipment), and when it comes to forming, every part is a good part. So the days of making setup parts are gone. 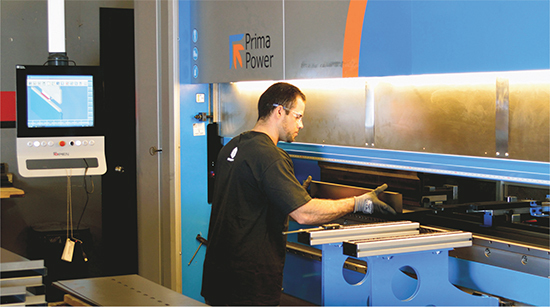 Article provided by Prima Power North America, Arlington Heights, IL; www.prima-na.com.